FOR SOME, THE WIDE OPEN HUDSON can be intimidating. Large tankers power by, on their way north to Albany. Waves are stirred up by tugboats and speedboats. And the river, sometimes, looks so wide and cold and (often) brown. But the times when the water is like glass, like the surface of a mountain lake, come more often than you might think. On the weekends, most of the boat traffic has stopped. In particular, catching the early morning sunrise and late afternoon and evening sunsetfrom the cockpit of a kayak can be especially soothing. After leaving the kayak launch at Losee Park, we often paddle north (away from the bridge). You can duck in among the pylons of the Tarrytown Marina, and then skirt the edge of Pierson Park, following the shoreline. When you pass the lighthouse, you get your only chance to see its bell (it’s mounted on the river side of the lighthouse). Past the lighthouse, you’ll arrive at the secluded beach at Kingsland Point Park. Once you’ve paddled past this beach, keep your eyes out for the mouth of the Pocantico River. You’ll have to time your exploration with high-ish tide, but when the river is full, you can easily paddle up the river, as far as the Mill Pond at Philipsburg Manor. 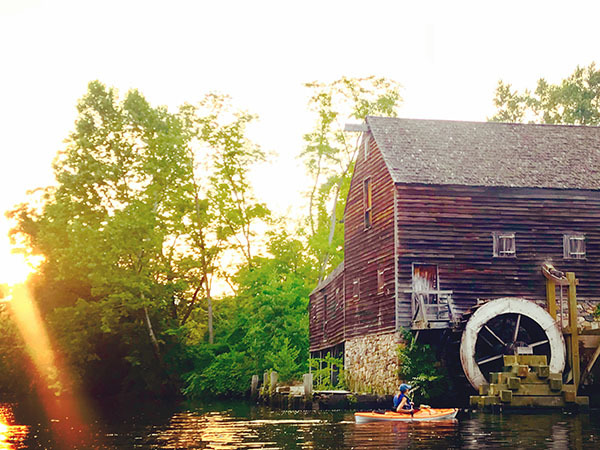 A TEAC kayaker in the mill pond at Philipsburg Manor. At high tide, the Pocantico River is navigable up to the manor and the mill pond (with a little ducking of branches). Several members of Tarrytown Environmental Advisory Council are active kayakers from spring to fall. We keep our boats at the new kayak storage racks in Losee Park, and go out as often as conditions allow. This helps us keep an eye on water conditions, trash that might be floating in the river, and other concerns. But more than that, we just enjoy the river from this unique perspective. If you’re interested in getting out on the river, contact us! One of our members can take you out (we have a spare kayak for you to use). If you’re already familiar with paddling, and want to learn more about storing your kayak by the river, check this out. If you’d like to get your feet wet with kayaking, but would rather do it in the smaller Tarrytown Lakes, you can rent a kayak from Hudson River Recreation when they’re stationed at the pump house on the weekends from Memorial Day weekend to Labor Day, from 12:00pm to 6:00pm (last rental time 5pm).